When I think of Alfred Hitchcock (1899-1980), the word happy doesn't readily come to mind, but I find his eloquent definition of happiness most profound. He claims he was most happy when he was able to create something—when all other distractions and negative emotions were removed and a figuratively clear road ahead was revealed. It's like having a empty canvas with space to work and create. In that sense, I can imagine him as happy. Although he was a master of mystery and macabre, he was one of the most brilliant, witty and inventive artists of the last century. If everyone believed in his same definition of happiness, what a wonderful world this would be! It's no surprise that Alfred Hitchcock began his career in show business as an illustrator, set designer and title designer in 1920. He even illustrated his own logo for the opening title of his television show Alfred Hitchcock Presents which premiered in 1955. Overtime, this logo became his brand and was permanently identified with his name and face. Not even Prince—with his trademark glyph—could master that kind of marketing! Watch an incredibly sinister episode below of a 1958 murder mystery written by the great Roald Dahl. It opens with his logo and his walk-on silhouette part. I find it especially laughable that Hitchcock opens with a scene of himself being issued a traffic ticket in a checkout line of a grocery store. He actually had a lifelong fear of policemen. Below is a wonderful mashup of Alfred and the Apple logo (sorry I could not find the artist's credit). As part of their famous marketing campaign of creative artists and inventors, Apple even featured Hitchcock's iconic photo in one of their Think Different posters. He was his own brand. :: Kudos to Maria Popova of Brain Pickings, for discovering the happiness clip on Open Culture. 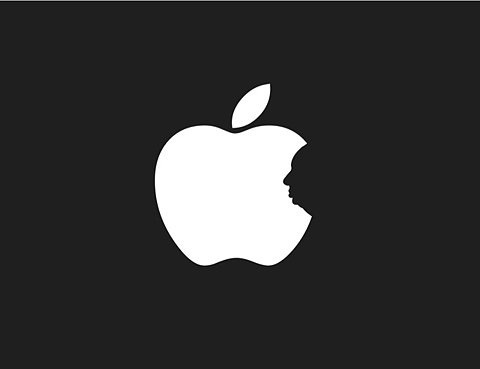 The Alfred Apple logo is via MacTumbler.